Chemical reactions are primarily the transfer of electrons. To understand the nature of this transfer and to identify the number of electrons taking part in this rearrangement, we need to understand the concept of oxidation states (number). Oxidation number of an atom is defined as “the charge that atom would have if the compound was composed of ions”. The definition for coordination compounds is a more complicated one according to IUPAC: “Of a central atom in a coordination entity, the charge it would bear if all the ligands were removed along with the electron pairs that were shared with the central atom. It is represented by a Roman numeral”. The actual distribution of electrons may or may not be exactly over a given atom in a molecule, but the concept of oxidation number helps us in simplifying the understanding of the complex reactions. Additionally, the oxidation number helps in exact systematic nomenclature of a compound. 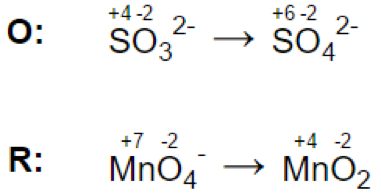 Oxidation number of S in S8. Since it is a pure element, the oxidation number of S = 0. O2 is the elemental form and hence, the oxidation state of Oxygen = 0. O2- is a monoatomic ion and hence, the oxidation state of Oxygen = the net charge = -2. O22- is the peroxide ion and in this case, two negative charges are taken as distributed equally over the two O atoms and hence each one has an oxidation state = -1. O2- is the superoxide radical and in this case, each of the O atoms have an oxidation state = -1/2. Oxidation state for each element in H3PO4. H3PO4 is constituted of three H+ ions and one PO43-. The obvious oxidation state of H is +1. The anion PO43- is a polyatomic ion in which the sum of charges of the P and four O must equal -3. Generally, O has the oxidation state of -2, which leaves P with oxidation state = -3 – [4(-2)] = -3 + 8 = +5. 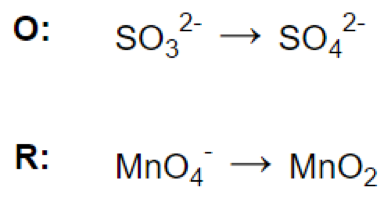 The task of balancing the redox reactions involves the identification of “half reactions” – a name for representing the reduction and oxidation reactions separately. This method is also known as the ion-electron method. An example is given below to illustrate the balancing a redox reaction by “half-reaction” method.